Shantel and Matt are such an awesome couple. Their friends and family are the nicest folks you can meet. It was an absolute blast being there to help capture their wedding at Silcox Hut. Guests had a fun time riding up in the big Snow Cat, there was still quite a bit of snow on the mountain, and the hut is only accessible by a grueling trek on foot through the snow, or such an all terrain vehicle. The weather for the day clouded over occasionally, but broke just enough for us to nail some really fun photos outside. Shantel and Matt are very sweet together, I loved hearing the story of how they met. Their first date was going to see “Guardians of the Galaxy” in theaters. As an ode to that, Shantel walked down the aisle to an acoustic cover of “Come Get Your Love” – I think it was perfect for the two of them. So, the clear highlight of the day for me. 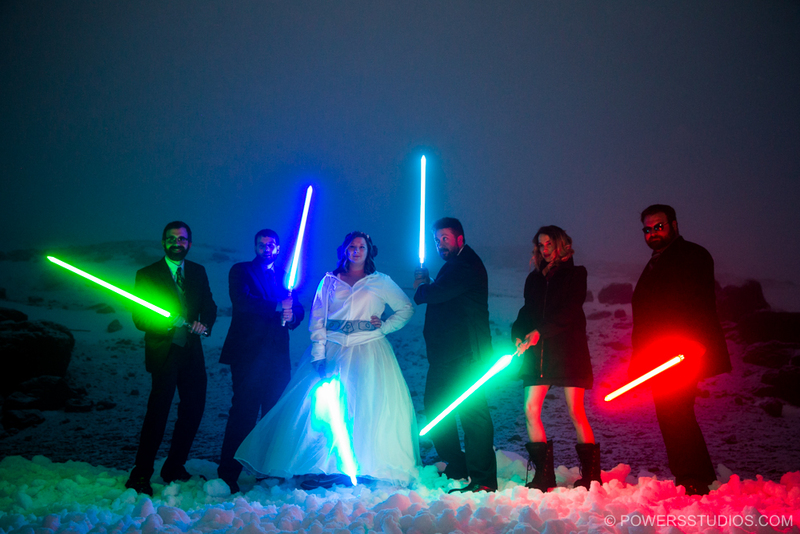 Lightsabers – which were Matt’s gift to his groom’s side. OMG yes. Lightsabers in the snow at night. Hoth references were made, and epically lit photos were taken. These weren’t toy lightsabers, these were serious replicas. Machined aluminum with LED blades. Truly elegant works made by the talented craftsmen at Saber Forge, based in Oregon City. The photos of Shantel and Matt side by side, lit by their blue lightsaber blades, just warmed my heart. I didn’t care how cold it was or that the snow had started coming down. I was a kid again, watching the original trilogy over and over again on VHS. I was so happy to be the one to help capture their wedding day. And yes, I went out and bought a lightsaber from Saber Forge a few days after the wedding. It’s on display in my office, and I will totally think fondly of this wedding every time I look at it.